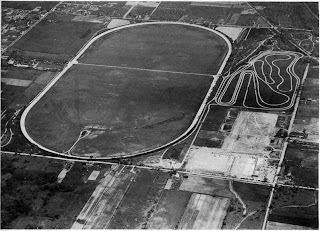 There are many well known automobile testing sites—Utah’s Bonneville Salt Flats and Colorado’s Pikes Peak come to mind—and some lesser knowns, like Michigan’s Packard Proving Grounds, built in the 1920s. Dozens of official and unofficial testing grounds have been used, and by now, you’ve probably guessed it. Yes … the Adirondacks once had their very own. While it didn’t have a national profile, Franklin County’s Studley Hill was widely reputed as the most difficult road in the north—unevenly surfaced, extremely steep, and with several sharp curves. Because hill-climbing ability was primary in determining a car’s quality, events and competitions became important to manufacturers and very popular with the public. Studley Hill is historically significant for many reasons, but the most unusual is the irresistible challenge it presented to some of the top car manufacturers of the early 20th century. Well, the lure actually was resistible for a while, and for one good reason: fear of failure. Salesmen wished to brag that their product could achieve wonderful things that other cars couldn’t, but it was best to first try Studley on the sly. If you didn’t conquer the hill, you didn’t talk much about it. That made for a lot of quiet car salesmen in the North Country. The automobile was still a new-fangled contraption that few people could afford, and folks traveling south from Malone on the Duane Road occasionally provided great amusement to those living on or near the hill. Some motored there for the challenge, and others came on joy rides, but from 1910 to around 1920, no one made it up Studley Hill’s steep northern slope. Only horse- or oxen-drawn vehicles could pull it off. Tradition so often gives way to technology, and that’s what finally happened. Improvements in performance led to the inevitable, and in July, 1920, Studebaker dealer J. Franklin Sharp of Ogdensburg officially became the first to make the climb in an automobile. 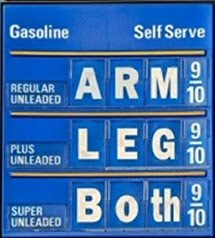 The real trick was to do it while keeping the car in high gear for the entire run. It was said that Packards had climbed Studley in the past, and that may have been true. Prohibition had been in effect for nearly a year, and the Packard was a favorite of bootleggers. The Duane Road was a route they commonly used. Sharp’s feat was easily achieved, but was not without drama. As one reporter put it, “The eyes of the motor world between Utica and the St. Lawrence River were turned this afternoon toward Studley Hill, the steepest grade in the northern country.” This was considered the first official test drive at Studley Hill, and looking at a map of the wilds south of Malone, one might argue that getting 159 people to such a remote location was the biggest accomplishment of the day. The wagering (men will make a game out of anything and then bet on it) was described as heavy. On the very first attempt, Sharp’s Studebaker Big Six (named for its six cylinders) sped across the flat road to a running start of 55 mph. As quickly as it began the steep ascent, the speedometer plunged. All the while, spectators cheered wildly. Difficult curves slowed the car, but after about a mile, it crested the hill. The car’s lowest speed was said to have been 15 mph. With Melville Corbett (Sharp’s garage foreman) behind the wheel, the trip was made in high gear four more times, carrying passengers that included Syracuse Post-Standard writers based in Malone and Saranac Lake. Meanwhile, Frank Sharp wasn’t finished for the day, deciding to attempt the hill in a lighter model, the Studebaker Special Six. Much to the surprise of himself and everyone else, the car climbed ably to the top. 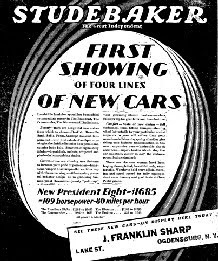 It was a great endorsement of the Studebaker brand for dealers across the North Country when headline stories later told the tale. Just as hiking down a mountain can sometimes be as difficult as climbing up, descending Studley Hill offered its own unique challenges. Many accidents there involving cars or horse-drawn vehicles prompted some unusual signage. Drivers approaching the steep descent to the north were cautioned by roadside warnings, the first of which offered the standard Drive Slow. A second suggested the harrowing drop that awaited: Keep Your Head. A third and very large sign was unofficially posted by someone with a wonderful sense of humor. And who would dare question its effectiveness? In large, hand-written, red lettering, it said simply, Prepare to Meet Thy God. Paige representatives from Malone and Rochester were on hand, proud to point out that, unlike the climb by Studebaker in 1920, their car did it without aerodynamics—the top and the windshield were up, and two passengers occupied the back seat. The wind drag and extra weight (the car alone weighed 3,500 lbs.) were handled on several successful attempts. Six months later, an Olds Four climbed the grade in high gear. Successful tries were often touted by the manufacturer as some type of “first.” The Olds people said theirs was the first “closed car carrying three passengers” to climb the hill in high gear. In 1922, a Durant Touring Car climbed Studley, “… the steepest and worst hill in the Adirondacks, and considerably harder to climb than the famous Spruce Hill at Elizabethtown on account of the abrupt incline and many turns.” Four men made the trip in what was claimed as the first ascent in high gear at all times under certain conditions (four passengers and much wind). The driver claimed he was going so fast at the third curve, he was forced to brake hard. The car lost most of its momentum but still completed the run. Again, the story was used in newspapers to advertise the wonders of the Durant. Tech nological changes led to even more impressive feats. In April, 1924, a Flint Six (made in Flint, Michigan by a Durant subsidiary) tackled what one writer called “the Waterloo of all cars.” This time there would be no running start. With the car parked at the base of the hill, high gear was engaged, and remained so throughout the climb. Despite sections of tire-sucking mud and slippery snow, the Flint crested Studley Hill without dropping below 15 mph. Besides the sense of achievement, one other award awaited at the top—a view of the flats to the east, ringed by mountains and featuring several streams leading into the Salmon River. Among those waterways near the base of Studley Hill is Hatch Brook, one of my all-time favorite canoe trips. It twists and winds through the valley for miles, and I paddle until the shores actually brush against both sides of the canoe. The next time I go, I’ll be thinking back to those days of the automobile hill climbs, but content with plenty of peace and quiet. ich Studley Hill provided- Below, advertisement for Frank Sharp’s Studebaker dealership. Very nice article. Thanks for the information.